Waterproof, shockproof construction, combined with the Nikon 1 AW1’s Underwater White Balancing, allows the 1 NIKKOR AW 10mm f/2.8 lens to deliver high quality shots in all environments. The fast f/2.8 aperture is perfect for low light scenes and action shots, and its sleek profile will make this a favorite lens on your Nikon 1 AW1. 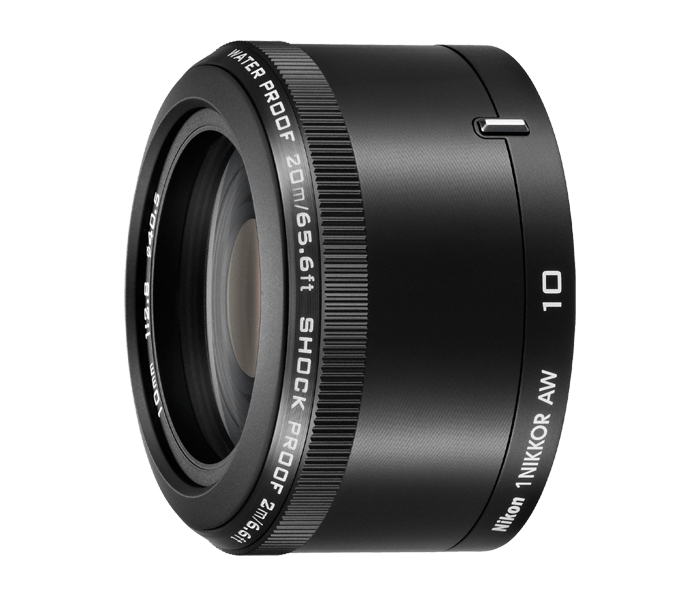 No need to pamper this workhorse lens. Built to capture sharp images under the most extreme conditions, it has the refinement you expect from a 1 NIKKOR lens, without limits. Keep it by your side, underwater to 49 feet and don’t be afraid to play hard—it can take a 6.6-foot drop. Your go-to lens for creating striking portraits and shooting in low light. The 1 NIKKOR AW 10mm f/2.8 provides portraits with delightfully blurred backgrounds, putting all of the attention on your subject. Low light venues and dim underwater scenes won’t stump this lens; it captures colors and sharp detail with ease. Carry it anywhere you want fast performance, remarkable portraits, or advanced low light capability. Relive moments with the perspective of wide angle. Group shots and creative landscapes never looked better. The rugged 1 NIKKOR AW 10mm f/2.8 fixed focal length lens is ideal for shooting grand landscapes, from snowy alpine mountains to colorful coral reefs, without leaving the action. From backyards to water parks, bring friends and family together for group portraits without cutting anyone out.